As the U.S., Mexico and Canada begin renegotiations of the North America Free Trade Agreement (NAFTA), we recognize that within the 23 years of enforcement, the treaty has harmed workers, the environment, and communities throughout North America. Now, at a time of increasing climate change and dwindling natural resources, instead of striving to create a single, unsustainable global economy through increased international trade, trade agreements could instead assist in the formation of new localized economies based around local resources. Trade agreements could be refocused in a variety of areas to be more equitable, inclusive and sustainable. While the original NAFTA negotiations were relatively transparent, since then trade negotiations have been more opaque with little public disclosure. The texts negotiated in the Trans-Pacific Partnership (TPP), for example, only became public thanks to WikiLeaks. To help in forming its positions, the U.S. called on more than 500 trade “advisors,” as the only people who can see and comment on the negotiations. The Washington Post graphically depicts how 85 percent of these advisors represent corporations. By making the negotiations more transparent, all segments of society will be able to comment on how the treaty would affect them. Past negotiations have had some open participation for those able to register, but they were often not located in the same area of the venue as the negotiations so it was not easy for negotiators to seek out civil society perspectives. No stakeholder participation has been scheduled in the NAFTA renegotiations and there are no plans to release the text. One of the most controversial elements of NAFTA, and most trade agreements since then, are their provisions granting corporations the ability to sue foreign governments over their domestic laws. These lawsuits, held in opaque courts with a three-judge panel of corporate lawyers, undermine the ability of governments to develop and enforce regulations in the best interest of their citizens. It can also cause a regulatory chilling effect, meaning that the next time a similar dispute comes up, a government might just let that investment go forward or change their law to avoid a dispute. Recent examples include the $15 billion lawsuit brought by Canadian energy company Transcanda when President Obama denied the permit for the Keystone XL pipeline. Rather than go forward with the lawsuit, President Trump approved the permit as soon as he got into office. 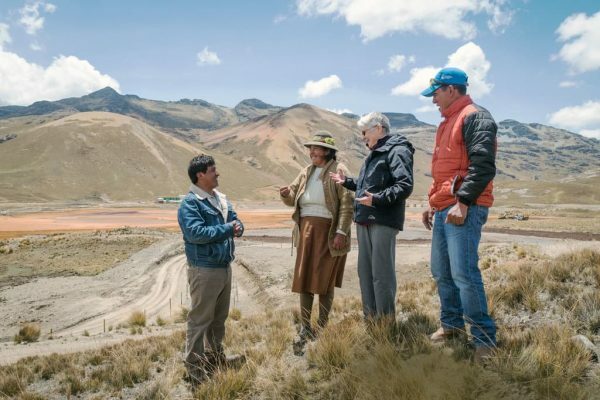 Maryknoll Sister Patricia Ryan works with an indigenous legal organization, Human Rights and the Environment (DHUMA), in Puno, Peru, that submitted an amicus brief to an ISDS case between Bear Creek Mining and Canada in 2016 which provided the court with the perspective of the communities. Sister Pat and DHUMA staff had a rare, if first, opportunity to be witnesses in the court room at the World Bank in Washington, D.C. and to have the case livestreamed. Read more here. Maryknoll Sister Patricia Ryan (second from right) confers with leaders of the village of Condoraque in Peru. Because of the negative impacts of ISDS, Bolivia, Indonesia, Ecuador and India have all begun processes to renegotiate or nullify treaties that contain ISDS. The agreement between the U.S. and Australia is one example of a trade agreement that does not include ISDS since both of their court systems were deemed strong enough to arbitrate in their national courts. If the other 11 countries move forward with the TPP, Australia would have to adopt ISDS. NAFTA negotiators should remove ISDS provisions, and allow only state-state processes that are transparent and have an appeals process. The United States has laws prioritizing “Buy America,” but trade agreements allow waivers to create a “more level playing field,” requiring governments to consider international corporations equally when making purchasing decisions. They also can’t favor specific types of businesses with desirable characteristics such as being locally owned, minority-owned, “eco-friendly,” cooperatives, etc. Yet this selective use of government purchasing power to favor local economies is a crucial tool to make the economy fairer and more sustainable in all trading countries. Cleveland and other cities have shown how using the purchasing power of “anchor institutions” such as hospitals, schools, government offices, churches, etc. to benefit local businesses can be an effective way to redevelop decimated urban centers. Governments around the world have used these tools for centuries to develop their societies as Ha-Joon Chang and others have documented. In 2008, labor unions brought the first ever trade dispute related to labor violations against Guatemala. In June, the arbitration panel found that Guatemala could continue to not enforce its labor laws because this hasn’t been shown to harm international trade. These side agreements offer little protection to workers. NAFTA rules related to intellectual property (patents and copyrights for example) have made access to life-saving medicines more difficult, created economic inefficiencies and other problems. A recently released study by three economists, including Nobel winner Joseph Stiglitz, explains the main problems with current intellectual property rules, how they are especially detrimental to countries in the Global South, and offers some more promising alternatives. For example, as countries seek clean energy technologies, developing countries should be allowed to access the technology more freely than patents permit. In the case of medicines, most pharmaceutical drug research is funded by the National Institutes of Health and thus the products from this research should be more accessible and affordable than they are. Ideally, assuming the point is to get medicine to people who need it, alternative means would be used to ensure expedient and affordable delivery. The Sierra Club has suggested other changes to trade law that can help in the global struggle to diminish climate change. These range from broad “carve outs” for climate policies, such as the Paris Agreement (exempting climate laws from being challenged in arbitration panels) to imposing climate duties on goods whose production releases excessive amounts of carbon. “A trade deal could [also] state that signatory governments must include a preference for goods and services with low life-cycle greenhouse gas emissions in procurement decisions,” states the organization. NAFTA’s energy chapter required that Canada and the U.S. have to maintain the same proportion of energy exports to each other every year. This prevents either country from reducing their energy production. Mexico did not sign this aspect of the agreement because their energy sector was still nationalized. In 2013, Mexico opened up their energy sector, leaving the door open that they too could adopt this provision and further locking North America into producing unnecessary quantities of fossil fuels. Instead, countries and municipalities could encourage “energy democracy” or energy that is community driven, community –controlled, and renewable. This model creates local, green jobs. These projects are popping up across the U.S. and globally. Trade agreements pressure governments to privatize many of their public services (health, education, energy, water, prisons, etc.). In many instances around the world, after privatization, services worsened and prices rose while poorer communities lost services altogether. This is why there is currently a wave of “remunicipalization” of services worldwide. Removing the profit motive from services is important to help create a more caring economy that values essential life services. Trade agreements should allow more flexibility around how services should be provided. NAFTA’s agriculture rules reinforce a corporate model of large-scale, single cropping agriculture plantations heavily dependent on fossil fuels and toxic chemicals. These rules should instead favor food sovereignty (people’s right to healthy and culturally appropriate food produced through ecologically sound and sustainable methods using local inputs; and their right to define their own food and agriculture systems). The largest international study of agriculture, the International Assessment of Agricultural Knowledge, Science and Technology for Development, has shown that agriculture is much more than simple food production and plays a crucial role in maintaining rural communities and environmental protection. IAASTD found that trade liberalization policies have had adverse social and environmental impacts while doing little to alleviate hunger and poverty. The Collective for the Defense of Indigenous Territories Of Oaxaca, a community-based organization supported by returned Maryknoll Lay Missioners, Phil and Kathy Dahl-Bredine, who are based in Oaxaca, offer this critique of NAFTA’s agricultural policies. The renegotiation of NAFTA is an opportunity to begin to rein in some of the excesses in modern trade agreements. Instead of reinforcing massive transnational corporations dominating a global economy, trade agreements could be reformed to help protect local economies and the environment. So far, the NAFTA renegotiations look a bit more like a TPP 2.0, but the negotiations are just beginning and there still may be some room for improvements.